Ed Thigpen is and was one of the more significant drummers in jazz history. In 2002 he was inducted into the Percussive Arts Hall of Fame, as well as enjoying a glorious career in the company of the greatest artist in jazz. He has been on more that 1500+ album recordings among others with his two danish groups Ed Thigpen Trio and Ed Thigpen Scantet, who he has recorded with after settling in Denmark. 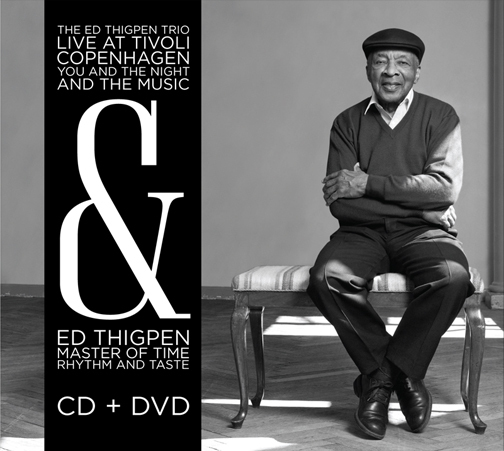 Ed Thigpen passed away on January 13th 2010 and unfortunately did not get to experience this formidable trio recording with it's relaxing yet engaging style of swing. This audio recording is from the live concert at Glassalen in Tivoli Gardens 2002 and catches Ed Thigpen at peak performance together with pianist Carsten Dahl and bassist Jesper Bodilsen. In addition MASTER OF TIME, RHYTHM AND TASTE, a personal 92 minute multifaceted DVD documentary by the acclaimed film director Don McGlynn is included in this release. The movie besides from being a historical document, also contains music specifically recorded for this movie as well as interviews and much more. A warm portrait of a musician and man who rests in himself and his past, but who is always exploring new way of expression. CD: Funk Dumplin / You’d Be So Nice To Come Home To / Down With It / Meaning / Shuffle Along / Well You Needn’t / You And The Night And The Music. Ed T. (d), Carsten Dahl (p), Jesper Bodilsen (b). DVD: Sweet Mama / Like Blues / Blues for H.P. / Fast Train / Shuffle Along / Message from Bud / Interviews / mm. Ed T. (d), Jens Winther (tp), Thomas Franck (ts), Horace Parlan, Kasper Villaume, Carsten Dahl (p), Jesper Bodilsen (b). The location for this event is at Templet, a jazz hotspot in the outerring of the Copenhagen area. Please come an enjoy a great evening with world class musicians and the spirit of legendary drummer Ed Thigpen. This events band consists of Steffen Gräwer (piano), Jesper Bodilsen (bass), Anders Bergcrantz (trompet), Thomas Franck(tenorsax) and Morten Lund on drums. Sweden was often visited by Ed Thigpen, and to host the tribute of this legendary drummer, tonights venue is at the Jazzclub 'Stardust' in Lund, Sweden. Olivier Antunes (piano), Jesper Bodilsen (bass), Anders Bergcrantz (trompet), Thomas Franck(tenorsax) and Morten Lund on drums.